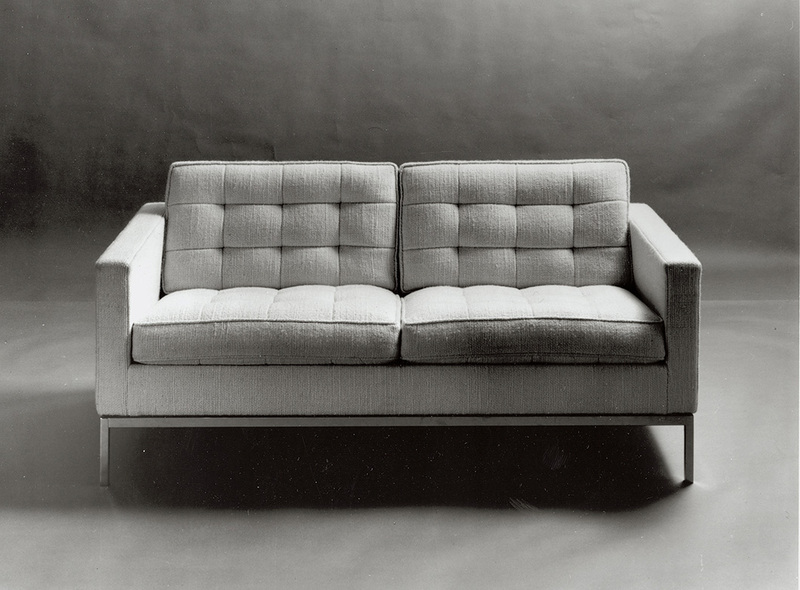 An early sketch of a sofa by Florence Knoll. Image from the Knoll Archive. Often denying the status of decorator or designer in favor of simply being a holistic arbiter and executor of good taste, the young Florence Knoll took on a variety of projects in her years with the Knoll Planning Unit. In the process, she made a great deal of furniture. And while her sofas, cabinets, and tables were always intended as supporting actors to the starring works of Eero Saarinen, Harry Bertoia, and Ludwig Mies van der Rohe—she would refer to her own furniture as the “meat and potatoes” that had to be provided—they have since become icons in their own right. 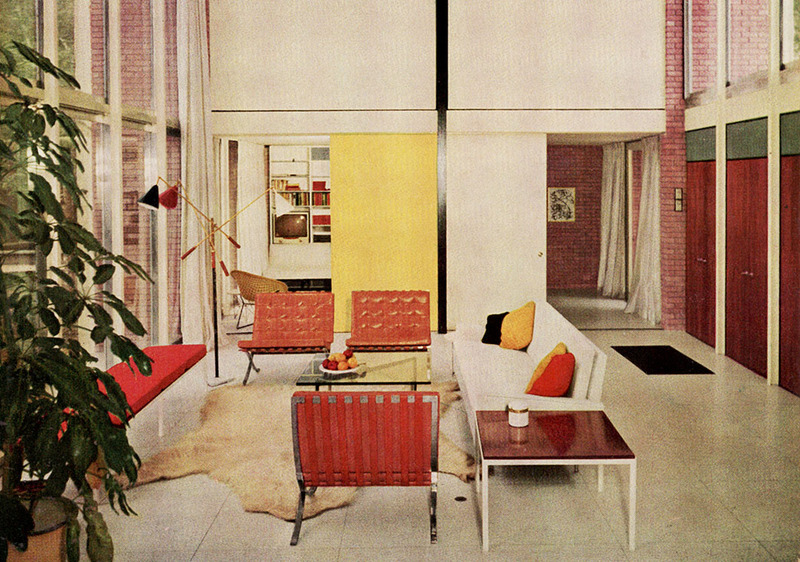 Florence Knoll viewed designs like her 1954 Settee as the "meat and potatoes" of the office. Image from the Knoll Archive. With her natural eye for design and her famous refusal to compromise on perfection, Florence Knoll devised solutions to office problems that hadn’t even been recognized before. By 1950, over a third of the 63 products offered in the Knoll Associates price list had been designed by Florence Knoll, or Shu, as she was lovingly known. Designed to meet the changing needs of the modern office, the Florence Knoll Lounge Collection has become a classic since its its introduction in 1954. Image from the Knoll Archive. Her Lounge Collection, designed in 1954, testifies to this understated commitment to quality. Poised on sleek metal frames, the Lounge Chair, Settee, Sofa all bear clear geometric profiles that celebrate the Bauhaus tenets of rational design, principles that Florence Knoll undoubtedly imbued from her mentor, Mies van der Rohe, during her studies at the Illinois Institute of Technology. Architectural in form, the rhythm and proportions of the collection echo those of the International Style that was at its zenith in the 1950s—structures that would inevitably be furnished and organized under the guidance of Florence Knoll herself. Still, she always spoke of her products only as practical solutions to the spatial problems of the office, rather than as standalone posterchildren of modern design. Florence Knoll seating designs installed in the office of Cowles Publications, where a sculptural Saarinen coffee table takes center stage. Image from the Knoll Archive. While they were initially conceived as fill-ins for executive offices and reception areas, the Lounge Collection began to seep into residential spaces in the decades that followed. Shu preferred the challenges of larger institutional projects, but she worked on the designs of several private homes as well—including that of Princess Fatima of Iran and the prominent biophysicist Dr. Detlev Bronk. 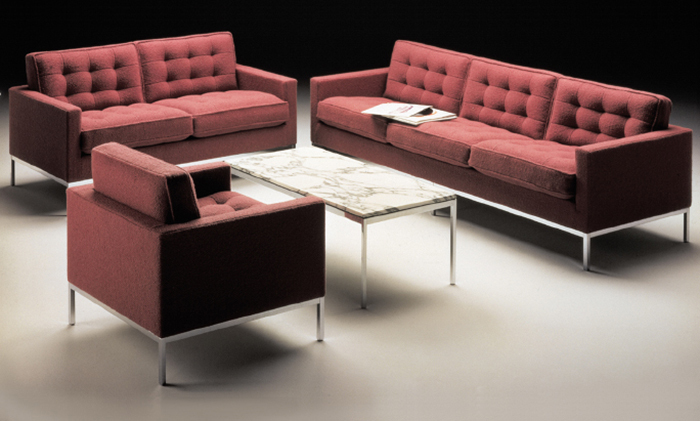 With a roster of influential clients, the Florence Knoll Lounge Collection piqued the interest of the design-driven public and was soon established as a singular classic of mid-century modern design—one that favored the timelessness of rectilinear order over the tempting trends of curvilinear forms. 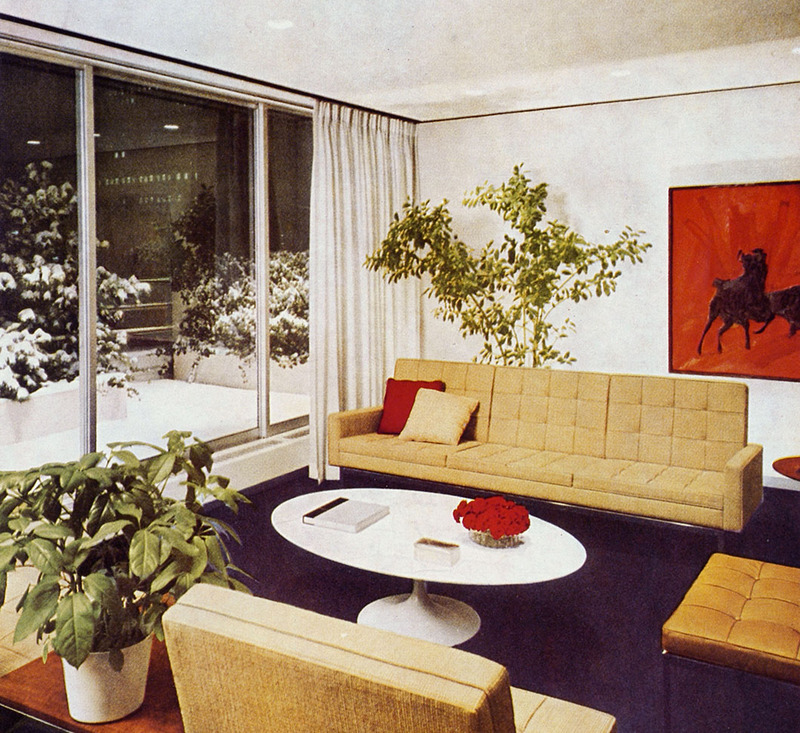 Popular for her refined aesthetic, Florence Knoll's sofa designs quickly found favor in residential spaces. Image from the Knoll Archive. But the structured solidity of the lounge designs was designed to complement the more sculptural offerings of the Knoll product line—and they still do so beautifully. The new Florence Knoll Relaxed furniture introduces a deeper, homier version of the classic collection that Florence Knoll had specified for commercial clients. In celebration of the legacy of the Florence Knoll Lounge Collection, Knoll will present a new set of residential designs inspired by the seminal products. The Florence Knoll Relaxed Lounge Seating will introduce softer, deeper cousins to the classic Sofa, Settee, and Lounge Chair, their generous cushioning to meet the needs of comfort and calm in the modern home. The End Tables designed by Florence Knoll as "fill ins" for the office designs of the Planning Unit. Image from the Knoll Archive. Further additions to the Florence Knoll line will include a series of Dining Tables and a Mini Desk that will similarly echo the successful forms of past designs. When Shu started out with the Knoll Planning Unit, she quickly upended the conventions of postwar American offices, using a scaled-down translation of the lines, gestures and materials of modern architecture to reflect a fresh corporate ethos. 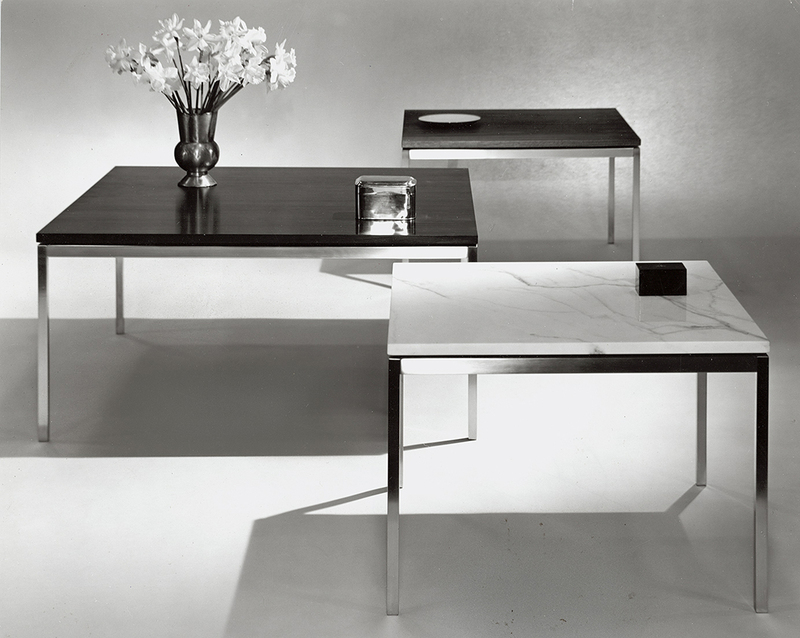 Among these designs were a series of End Tables that, in their slim frames, extended the aesthetic of modernism to every corner of a room. 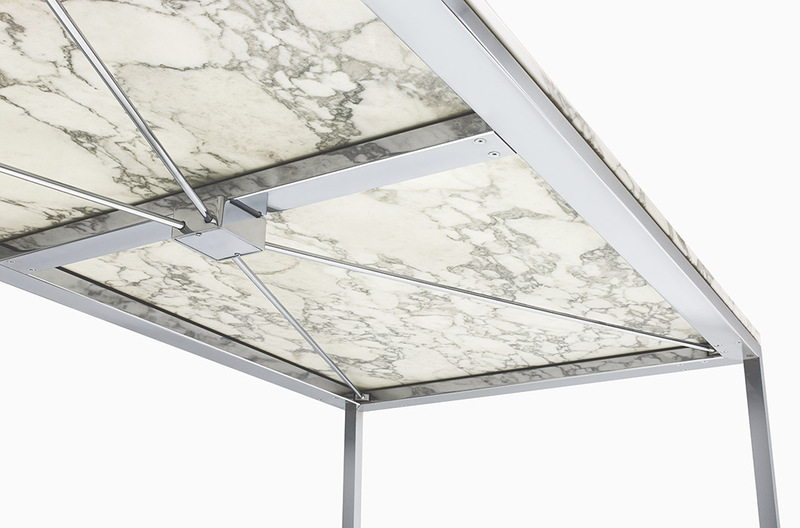 The undergirding structure of the Florence Knoll Dining Table. The new products, although designed for the home, encourage the same paring down of function, clear in their visual clarity and honest structural framework that Shu championed with her corporate commissions. The Dining Tables and Mini Desk will be available in a range of marbles, and the Mini Desk will additionally be offered in glass, lending the furniture enough range to be adapted to the tone of any environment. The Florence Knoll Dining Tables brings Shu's keen eye for modernist proportion to the tranquil enclosures of the private home. Florence Knoll Dining Table - 55" x 55"
Florence Knoll Dining Table - 60" x 36"
Florence Knoll Dining Table - 78" x 35"
Florence Knoll Dining Table - 94" x 39"
Florence Knoll Coffee Table - 23" x 23"
Florence Knoll End Table - 29" x 29"
Florence Knoll Mini Desk - 48" x 26"